Tiger Hoak was a major league third baseman who played for ten seasons beginning in the mid-1950s; his baseball career followed a stint as a professional boxer that ended after being knocked out in seven straight matches. His biggest claim to fame may have been his writing about a game that took place on January 22, 1951. According to Hoak, Castro and some friends commandeered the park where Hoak’s team was playing. Castro was a law student at the University of Havana at the time and a player on an intramural baseball team. Castro took the pitcher’s mound, and after some warmup pitches, turned to face batter Hoak. Castro shouted out something in Spanish that translated to “die, American imperialist pig” or perhaps “batter up.” Castro’s pitches were wild, and Hoak was no doubt thinking at the time “I hope this guy’s never in charge of missiles or anything.” Castro grazed Hoak’s head a couple of times, then beaned him. Hoak turned to the umpire and said, “Get that idiot out of the game!” The umpire spoke to some park policemen, who in turn marched Castro off the field. Hoak went onto the U.S. majors, and Castro went on to the really big Cuban majors, taking over the government in 1959. 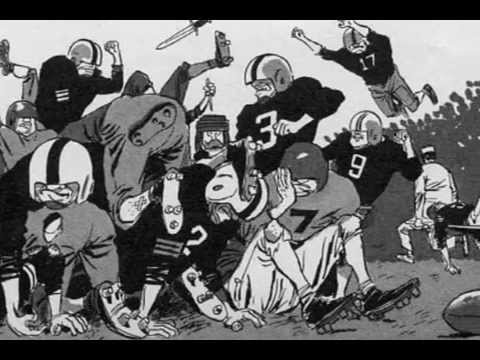 In 1960, Castro had his revenge when he outlawed all professional sports, including the Cuban Winter Baseball League. Douglas Corrigan, born on January 22, 1907, was an American aviator. In 1938, he bought a fixer-upper airplane and rebuilt it himself. Then in July of that year he flew nonstop from California to New York. This wasn’t a first by any means; he only got national attention because no one thought his clunker would make it. In New York, he filed flight plans for a transatlantic trip but was denied permission by aviation authorities. They did grudgingly give him permission for a return trip to California, and once again he took to the air. Twenty-eight hours later he touched down in Dublin, Ireland, expressing surprise that it didn’t look much like California. When advised of his actual location, he aw shucksed a story about getting confused in the clouds with a bum compass. No one believed it, and he was grounded and shipped back to the states along with his plane. But “Wrong Way” Corrigan had become a national celebrity. Sir Walter Raleigh, born on January 22, 1552, was what you might call an English dabbler. He colonized, soldiered, explored, spied, wrote poetry, played at politics, and pushed tobacco. He was a favorite courtier of Queen Elizabeth I because, as legend has it, he spread his coat over a puddle so she wouldn’t get her feet wet. He was executed in 1618 by James I, perhaps because he didn’t spread his coat over a puddle so the king wouldn’t get his feet wet. Fortune had taken a keen interest in Delia’s affairs during this Cuban summer, watching over her and acting on her behalf, so it didn’t surprise Delia at all when her father told her that he had to go to Santa Clara for several days, leaving just a day before Carmen Miranda arrived. Delia would be left in the care of their housekeeper Josefina, a wonderful woman who could not be distracted from her television set after nine o’clock by anything on this earth, let alone by a teenager slipping out the back door for an evening at the Tropicana. Carmen Miranda arrived in Havana on the fourth of July in the glorious summer of 1955. There were fireworks aplenty in that nation to the north, but none here where they should have been. The previous night, with Jorge still fence sitting on the subject of taking her to the Tropicana, Delia decided to play Carmen for him, hoping this would propel him in the proper direction. She first got the idea of dressing up as Carmen Miranda after seeing the movie Scared Stiff, in which Jerry Lewis had done the same thing. Practically everyone had at some time impersonated Carmen – she was an easy study – but for Delia this particular performance was like an insurance policy: No matter how bizarre her own performance might be, it couldn’t be as outlandish as this one. She donned a costume of red, gold, orange and yellow silk scarves pinned together along with a crown of bananas, put a recording of “Cuanta la Gusta” on the player and strutted before Jorge. As the energy from the recording infused Delia, she moved with sensual abandon before her awestruck audience, their eyes locked. As the song ended, and she flew into Jorge’s arms, she knew that the speed limit would be broken tonight. The Tropicana was a frenzied, pulsating place, as animated as the tourists and Havana socialites who crowded the casino, bar, dance floor and every table, there to be entertained by a half dozen celebrities, three full orchestras and the Tropicana’s own ballet troupe. It had not been easy for Jorge to secure a table, and when he did, it was some distance from where Carmen Miranda would shortly perform. He liked the table just fine, not wanting to be conspicuous in such a place. Delia wished they were closer but couldn’t say anything, and just being here was the high point in her sixteen years plus four months. She looked as mature as any seventeen-year-old in the place, sipping the wine Jorge had bought her and wearing another bright outfit that Carmen herself might have worn, but without the tutti frutti hat, of course, for that would be presumptuous. 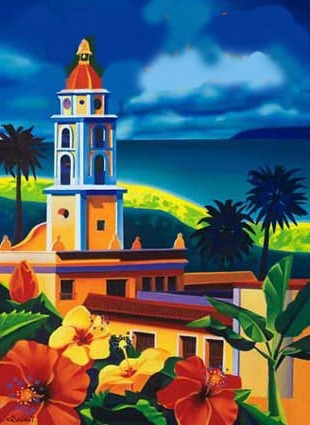 Miranda’s Boys broke into a spirited overture, and suddenly there was Carmen Miranda herself, bouncing to the beat of “South American Way.” Jorge turned to see the look on Delia’s face, but there was no look on Delia’s face because there was no Delia. He scanned the floor, fearing she had fainted in her excitement. Nothing. Then he spotted her, crawling on hands and knees between the tables, toward the stage. He closed his eyes afraid to watch but finally had to look again. He spotted her as she squeezed unnoticed between the chairs occupied by the sleek black-haired man and his sleek black-haired companion, disappearing under the table next to where ­Carmen Miranda sang and danced. Then Carmen jumped into one of Delia’s favorites: “Mama mama mama eu quero, mama eu quero, mama eu quero mama, da a chupeta, da a chupeta . . .” A few lines into the song, one of her most famous and one she had probably sung hundreds of times, she stopped and stared into the immense room before her as though she had become lost. “Para bebe” came a whisper from under the nearest table. Carmen dove back into the song, and few in the audience were aware of the lapse. There were no further lapses and the song appeared to be headed toward a successful conclusion. About the only warning the black-haired couple had of the impending disaster was the dancing of the olives in their martinis, a nervous samba in time to the music coming from the stage. Back in the days when football was still known as that game with the pointy ball, the son of German immigrants became the coach at the Georgia Institute of Technology (known to its friends as Georgia Tech). John Heisman became the first coach in college football to be paid for his services. They got their money’s worth. He led the school to its first national championship and had a career winning percentage of .779 which remains the best in Tech history. The most memorable — or perhaps infamous — game in Heisman’s Georgia Tech career was played on October 7, 1916, with Tech playing host to Tennessee’s Cumberland University. Talk about a nail biter! The plucky Cumberland Bulldogs got off to a bad start, losing the coin toss. Georgia Tech returned the Bulldogs’ first punt for a touchdown. Score 7-0 in less than a minute played. Cumberland fumbled on its first play after the following kickoff. 14-0, with just seconds off the clock. On their next possession, the Bulldogs fumbled once again on their first play. 21-0. It went pretty much the same until the game mercifully ended with a score of 222-0. A record, of course, that still stands. In Cumberland’s defense, it should be pointed out that the college, on the verge of bankruptcy, had eliminated its football program at the beginning of the season. The school was forced to field a team (fraternity brothers of the team’s student manager) to avoid a $3,000 forfeit fee. After a movie like Freaks, a light diversion might be in order. How about a guy with no head? That should be amusing, especially when he’s terrorizing our plucky hero who was probably warned not to walk through the forest at midnight. 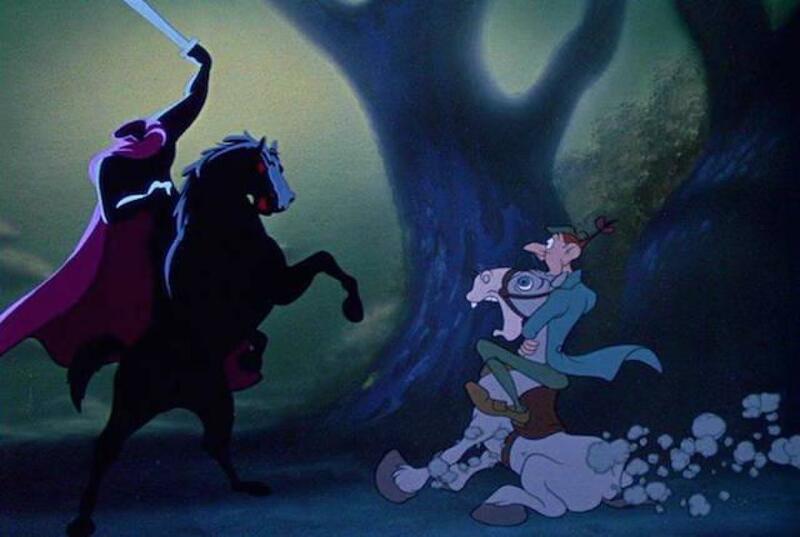 The story is the classic by Washington Irving, “The Legend of Sleepy Hollow.” The not-so-nightmarish film version dished up by Disney is the Ichabod half of Ichabod and Mr. Toad. And if you get too scared, you can always cavort with Mr. Toad. Another place you shouldn’t be wandering around late at night — the Moors. Who knows what you’re liable to encounter. The Hound of the Baskervilles, perhaps. 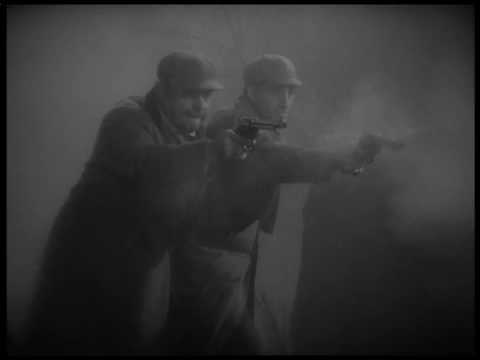 This 1939 Sherlock Holmes outing features Basil Rathbone as the detective. As it progresses, you’ll see that it’s a highly subjective list, reflecting a few of my own biases. You won’t see Halloween Chainsaw Bloodbath on Elm Street or any movie featuring flesh-eating zombies. JUNE 12, 1349: IF YOU OUTLAW BOWS AND ARROWS . . . IF YOU OUTLAW BOWS AND ARROWS . . . In a letter dated June 12, 1349, England’s King Edward III wrote how the people of his realm, both rich and poor, had in previous times exercised their skill at shooting arrows and how that practice had brought honor and profit to the kingdom. But, he continued, that skill had been laid aside in favor of other pursuits. Therefore he commanded sheriffs throughout the realm to proclaim that every able citizen in their leisure time use their bows and arrows, and learn and exercise the art of archery. And furthermore, they should not in “any manner apply themselves to the throwing of stones, wood, or iron, handball, football, bandyball, cambuck, or cockfighting” or any other such trivial pursuits (that includes golf). 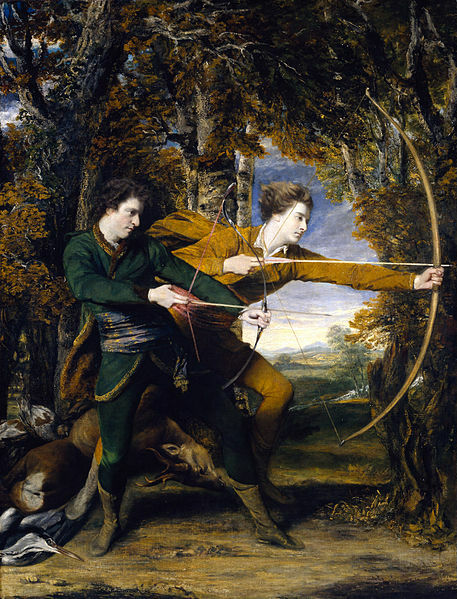 A hundred years later, Edward IV continued the tradition, decreeing that all Englishmen, other than clergymen or judges, should own bows their own height, keeping them always ready for use and providing practice for sons age seven or older. Fines were levied for failing to shoot every Sunday. Sir Wayne of LaPierre complained that the law did not go far enough, that it lacked a provision that citizens should carry concealed bows and arrows and quivers with more than a ten-arrow capacity. And a ban on background checks for potential archers, of course. A person pushing sixty pretty hard probably has no business on a bicycle in the first place. Like skis, surfboards and roller skates, they are the dominion of those young enough to have more vigor than common sense. And if people pushing sixty are foolish enough to bicycle the six miles to ‘Sconset, they tend to tire about halfway. If they’re at all smart, they’ll stop and rest, rather than continue on until the bicycle just rolls to a stop and plops over sideways. Which is what I did, and why I’m in this mess. There’s a particularly good resting spot that’s almost exactly halfway. You reach it about two minutes before your heart and lungs give out completely. It’s where, on the side of the road opposite the bike path, a dirt pathway takes off through the tangles of scrub oak and meanders a quarter mile to the bogs. And it’s also where, if you’ve timed it just right, she emerges from that very dirt path. She’s young enough that she probably doesn’t have to stop and catch her breath and pretty enough that she takes mine away. At least she did. For the past week, she appeared and captured my fantasies. She’d cross the road, stop, her bicycle nuzzling mine, and devour me with big brown eyes and a seductive smile. We’d laugh, touch and – she didn’t really stop, of course; she gave me a quick smile as she passed me and headed off in the direction from which I’d just come. Until today, that is. I arrived at the same time as usual and waited for her appearance. But it didn’t happen. I waited for five, ten minutes and, yes, I worried. I don’t know why. Obviously, I should have forgotten my disappointment and, with hope she’d be there tomorrow, just continued on to ‘Sconset. Instead I pushed my bicycle across the road, rested it behind a large bush and trudged off down the dirt path. I walked the full quarter mile without seeing anyone, and rounding a patch of heath, reached the first bog, an oasis of dark green foliage pregnant with bright red cranberries girded by a sandy dike. Every twenty yards a sign reminded me that the bogs were private property and the picking of cranberries illegal. Each bog forms the center of a man-made crater and the dikes between craters form a meandering path. At harvest time in October, the crater is flooded and with a little prodding the cranberries just float right up to the surface for easy scooping. It’s a fascinating process, and I guess in my fascination my mind wandered off somewhere – they do that when you’re pushing sixty. I don’t know how long it was gone, but when it returned I was standing at the edge of the second bog. Looking down, I saw it – him. A man, clad only in red boxer shorts, lying face down in the cranberry bog. MAY 8, 1854: A MILE IN WHOSE SHOES? A MILE IN WHOSE SHOES? Celebrated pedestrian Robert Barclay Allardice, 6th Laird of Ury, generally known simply as Captain Barclay, died on May 8, 1854. During his life he accomplished many feats in the world of walking, and is, in fact, considered the father of pedestrianism, a popular sport of the 19th century. His first feat, at the age of fifteen, was to walk six miles in an hour ‘fair heel and toe.’ Heel and toe was a rather vague rule of pedestrianism, that the toe of one foot could not leave the ground before the heel of the other foot touched down. It was randomly enforced. In 1801, at the age of 22, Barclay walked from Ury to Boroughbridge, a distance of 300 miles in five oppressively hot days, and in that same year, he walked 90 miles in 21 and a half hours, winning 5000 guineas for his fancy footwork. His most famous feat came in 1809 when he undertook the task of walking 1000 miles in 1000 successive hours, a mile within each hour, a challenge in which many had failed and none had succeeded. At stake was 100,000 pounds (roughly 8 million dollars today). This feat captured the imagination of the public, and 10,000 people came to watch over the course of the event, cheering him on or wishing him ill fortune depending on the direction of their own wagers. He began his course at midnight on June 1 and finished it at 3 p.m. on July 12. On May 8, 1877, 1,201 of the classiest American canines convened at the Hippodrome in New York City to compete for the the title of top dog. 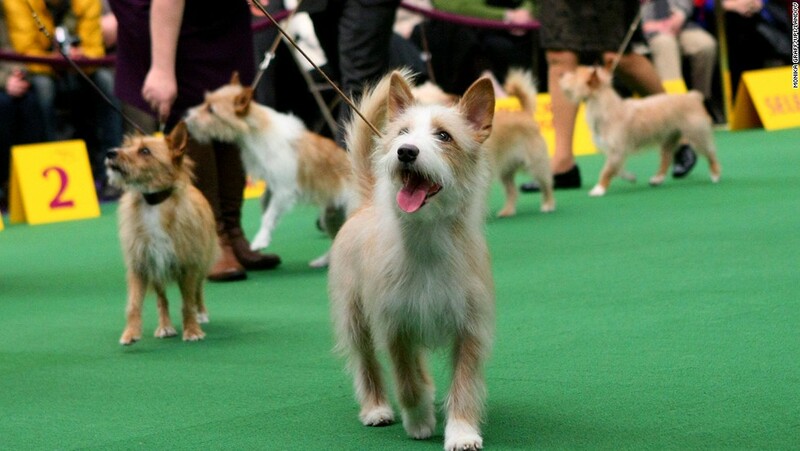 This was the first dog show to be held under the guidance of the Westminster Kennel Club, and it has been held annually ever since. Among the luminaries at that first event were two Staghounds from the pack of the late General George Custer and two Deerhounds bred by Queen Victoria. Eighteen years later, on May 8, 1895, felines had their turn in the spotlight at the first cat show held in New York at Madison Square Garden. This was a more down to earth affair with prizes given in several categories including the best stray alley cat. The New York Jets were leading the home team Oakland Raiders by a skinny three points, 32-29, on the afternoon of November 17, 1968. NBC was airing the game for sports fans throughout the country. It was a game between two formidable adversaries, and a hard fought one. The intensity of the play had led to injuries, penalties, extra timeouts and lots of scoring, with the lead changing eight times. As a result, the game ran longer than usual, longer than the three hours NBC had allotted for it. That meant that on the East Coast the game ran right into the 7 p.m. time slot when the evening’s prime time schedule was set to begin. With just minutes left in the game, eastern viewers were switched to Switzerland for the television movie Heidi, the heartwarming story of a sweet little girl and her kindly grandfather, filled with Alps and yodeling and stuff, but no football. Worse, still, as Heidi cavorted with her goats, the Raiders scored two touchdowns in nine seconds to win the game. Football fans were not pleased. As it turns out, NBC executives had decided to postpone the start of the film, but they couldn’t get through to the studio because the switchboard was jammed with irate football fans. The Heidi Game, as it came to be called, led to a change in the television broadcasting of football; the NFL inserted a clause into its TV contracts that guaranteed all games would be broadcast completely. Television networks had separate telephone exchanges installed (known lovingly as Heidiphones) to prevent such incidents from happening in the future. In 1997, the Heidi Game was voted the most memorable regular season game in U.S. professional football history. 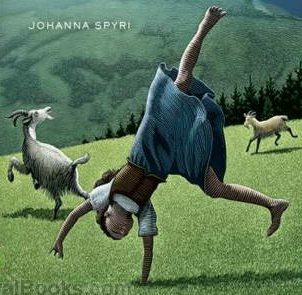 Heidi remains the most memorable film about little girls and mountain goats.